Aortopulmonary (AP) window is a rare cardiac anomaly that comprises only 0.1% of all congenital heart diseases. It has been reported to be associated with a variety of other congenital heart diseases; however, its association with total anomalous pulmonary venous connection (TAPVC) has so far not been reported, to the best of our knowledge. Echocardiographic clue for the presence of AP window is usually left heart volume overload. However, diagnosis of AP window may be challenging in the presence of TAPVC because of dilated right heart and associated pulmonary hypertension. An 8-month-old male child was admitted with a history of frequent cough and respiratory distress from 3 months of his age. He was referred to our hospital on detection of a murmur by his pediatrician. At admission, he was in congestive cardiac failure. A Grade 3/6 short systolic murmur along the parasternal area with loud and palpable second heart sound was appreciated. Resting saturation was 85%. Chest roentgenogram showed cardiomegaly and pulmonary plethora. Echocardiography showed enlarged right atrium, right ventricle (RV), pulmonary artery, supracardiac type TAPVC (three pulmonary veins were delineable) with an ostium secundum atrial septal defect (ASD) with right to left shunt, and severe pulmonary hypertension. He was treated with oxygen and decongestive measures. Cardiac computed tomography (CT) was done to delineate the anatomy of pulmonary veins fully. It confirmed the presence of supracardiac TAPVC [Figure 1]a and [Figure 1]b. In addition to TAPVC, a 1.1 cm proximal AP window (Type I of Mori's classification) was also detected in CT angiogram which was missed in the initial echocardiogram [Figure 2]. Repeat echocardiogram with a more vigilant search for the above showed echo dropout in the parasternal short-axis scanning along with flow reversal on descending aorta. We initially missed the AP window due to the high pulmonary arterial pressure (PAH) and because we did not think of its possibility. Child underwent surgery, but unfortunately expired on postoperative day 7 due to severe pulmonary hypertension. AP window is a rare cardiac anomaly which comprises only 0.1% of all congenital heart diseases. It causes left to right shunt of blood and mimics patent ductus arteriosus physiologically. Aortic arch anomalies are the most common associated cardiac lesions reported with AP window. Associations of AP window with arch abnormalities, ventricular and atrial septal defects ASDs, transposed great arteries, anomalies of right ventricular outflow tract or patent ductus arteriosus have been reported previously., However, association of AP window with anomalous pulmonary venous inflow has not been reported so far. It is unlikely that there is an embryological basis for this association. The timing of the formation of the common pulmonary vein and AP septum is also different. There is no universally accepted theory about the development of the common pulmonary veins. It is generally agreed that by the end of 4 weeks the pulmonary vein can be identified as a separate vessel entering the sinoatrial portion of the heart. The development and septation of the cardiac outflow tract, on the other hand, is a slightly later event. The septation of the outflow tract into two spirally oriented channels occurs through the 5–7 weeks of gestation. Although both AP window and TAPVC can cause symptoms in the early infancy, the former causes left heart volume overload, whereas the latter causes right heart volume overload. Pulmonary hypertension can be seen in both lesions. Although echocardiography is very useful for the diagnosis of AP window, the normal echo dropout seen in high parasternal short-axis view due to parallel ultrasound beam may be difficult to differentiate from a true defect. The presence of the “T” artifact, nonvisualization of two separate walls of the aorta and the pulmonary artery and diastolic flow in pulmonary artery can help us to identify the AP window., However, in the setting of severe PAH, because of high pressures in the pulmonary artery, Doppler features might be attenuated. Diagnosis may be difficult especially when we do not suspect it in the first place. Absence of left-ventricle volume overload and the presence of RV volume overload due to TAPVC in this infant were the reason why AP window was not suspected in the first place. Moreover, the echo diagnosis of TAPVC seemed to confirm the clinical setting of mild cyanosis and severe pulmonary hypertension in this infant. Retrospectively, the presence of descending aortic flow reversal which was missed in our first echo was a valuable clue for the presence of AP window. Treatment of both AP window and TAPVC is early repair to avoid the development of irreversible pulmonary hypertension. The results are good when the AP window is isolated, and repair is done in early infancy. Patients with associated lesions have a protracted hospital course and a higher early mortality, but similar late survival. Talwar et al. in a recent surgical series have reported a mortality of 21% (4 out of 19 cases) in those with associated lesions and a mortality of 6.97% (3 out of 43 cases) in those with isolated defects. The mean age of the patients at the time of repair was 21.6 ± 32.02 months. Our patient had a severe pulmonary hypertensive crisis and succumbed to it despite aggressive supportive care postoperatively. AP Window should always be kept in mind and searched for actively during echocardiography, especially in the presence of right-sided volume overload and pulmonary hypertension when it is most likely to be missed. Kutsche LM, Van Mierop LH. Anatomy and pathogenesis of aorticopulmonary septal defect. Am J Cardiol 1987;59:443-7. 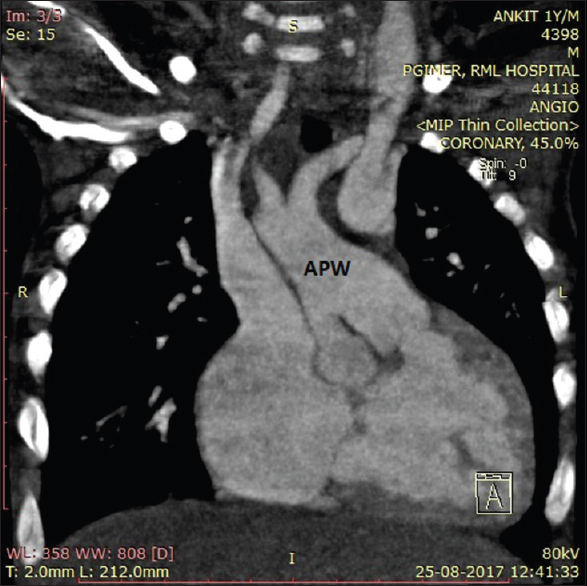 Kiran VS, Singh MK, Shah S, John C, Maheshwari S. Lessons learned from a series of patients with missed aortopulmonary windows. Cardiol Young 2008;18:480-4. Talwar S, Agarwal P, Choudhary SK, Kothari SS, Juneja R, Saxena A, et al. Aortopulmonary window: Morphology, diagnosis, and long-term results. J Card Surg 2017;32:138-44. Sizarov A, Baldwin HS, Srivastava D, Moorman FM. Development of the Heart: Morphogenesis, growth, and molecular regulation of differentiation. Allen HD, Shaddy RE, Penny JD, Feltes TF, Cetta F (eds). Moss and Adams' Heart disease in Infants, Children, and Adolescents, Including the Fetus and Young Adult, 9th ed. Philadelphia: Lippincott Williams & Wilkins (LWW); 2016. pp. 1-55. Balaji S, Burch M, Sullivan ID. Accuracy of cross-sectional echocardiography in diagnosis of aortopulmonary window. Am J Cardiol 1991;67:650-3.